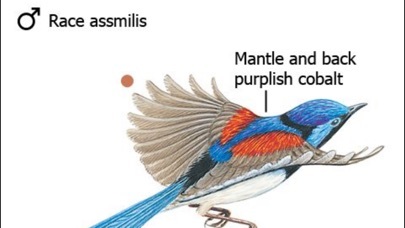 The foremost field guide to Australian birds is now available on the iPhone, iPod Touch and iPad with a comprehensive collection of bird calls. ** If you would like to experience the app check out The Michael Morcombe eGuide to the Birds of Australia LITE which is FREE and includes 59 species ** Michael Morcombe’s Field Guide to Australian Birds has been called the most comprehensive field guide to Australian birds in the market today and now it is perfectly complimented by the eGuide which features: ● iPhone optimised controls – swipe to next or previous species, one-tap enlargement of an image and rotate the device (landscape) to enlarge an image completely (and fit the width of the screen). ● Over 3000 hi-res bird images covering over 790 bird species. 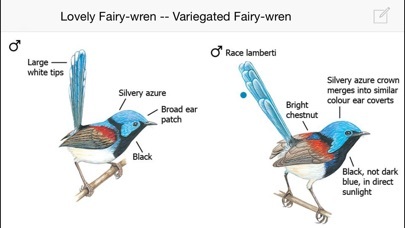 ● Most bird species have a detailed distribution map showing any subspecies that occur. 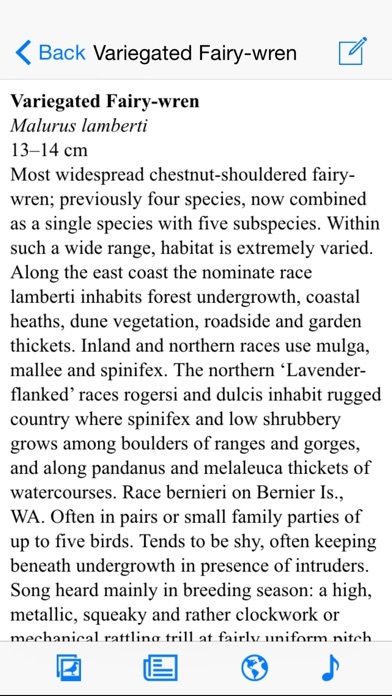 ● Detailed text descriptions of almost all bird species including songs and calls, measurements and breeding behaviour. ● Over 1800 carefully-selected and edited sound recordings for over 600 species. Many species are represented with multiple call examples showing the full range of vocalizations. ● The ability to compare any two images, maps, or sounds, side by side on the screen. The ability to filter by geographic location, so that you see only the species likely to occur in your location, and to further reduce the possibilities to usual or vagrant species in the selected area. ● A “Smart Search” that gives the ability to search by distinguishing features such as size, colour, physical features, habitat and exclude certain types of birds (eg. 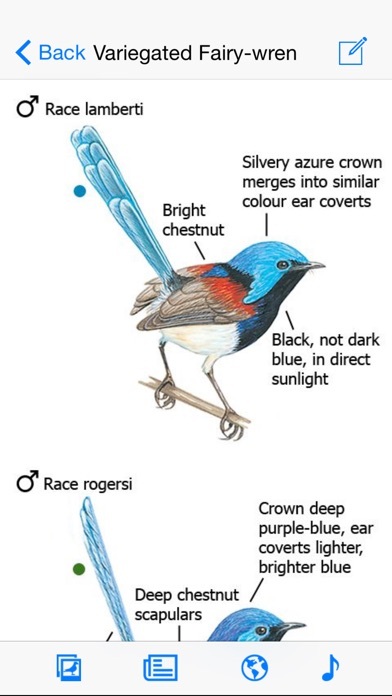 Passerines). ● A basic personal species list that stores your sightings saved to the device* (ability to upload list coming soon) ● A comprehensive help and introduction section to help you if you get stuck or don’t understand how a certain feature works. *Uninstalling/reinstalling the program will result in the loss of your list, it is recommended that you keep your own backup (master list) separate from the application. We invite all users to share their comments and ideas on our forum at www.mydigitalearth.com NB. This Application WILL ONLY work on an iPhone or iPod Touch running iOS V7.1 or higher NOT A NORMAL IPOD CLASSIC/NANO and the download is about 320MB. I appreciate the convenience of bird guide apps over carrying a bulky and heavy print book in the field. 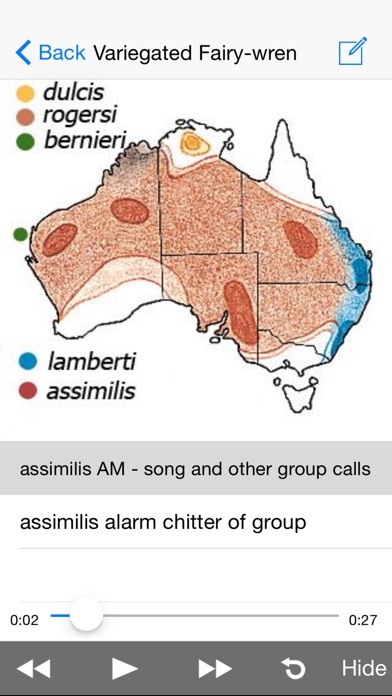 I am using this to study for an upcoming trip to Australia. The drawings are very good, especially the highlighted notes around each. There are a few species with no associated picture. I would like to see the ability to import photos added. I've seen other birding apps with this feature and it is helpful. The ability to restrict the displayed birds by region is a good one, especially as it has a map which highlights the selected area. That is essential for the first time visitor. I have bought other birding apps specific to Oz, but this is the only one I need. With pictures, audio clips of bid calls, maps, descriptions, it outshines any other birding app. I can also track sightings, which I didn't realize til I was exploring the app. But since I'm new to birding, I don't always know what I'm looking at - the smart search feature is what makes this app worth $30!!! It may seem a lot, but it's cheaper (and smaller) than his amazing book. Totally worth the money and perfect for newbies!